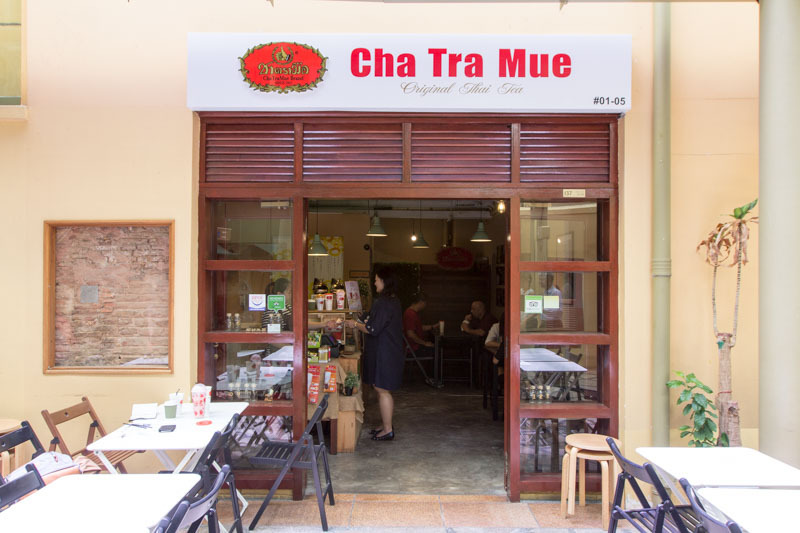 There are Thai milk tea shops aplenty in Singapore, but Cha Tra Mue probably has one of the longest queues around, and for good reason. This Thai brand dates back to 1945 and only opened on our sunny shores in 2013. Despite that, we still don’t have the full range of products from the Thailand side yet, but it’s slowly changing. 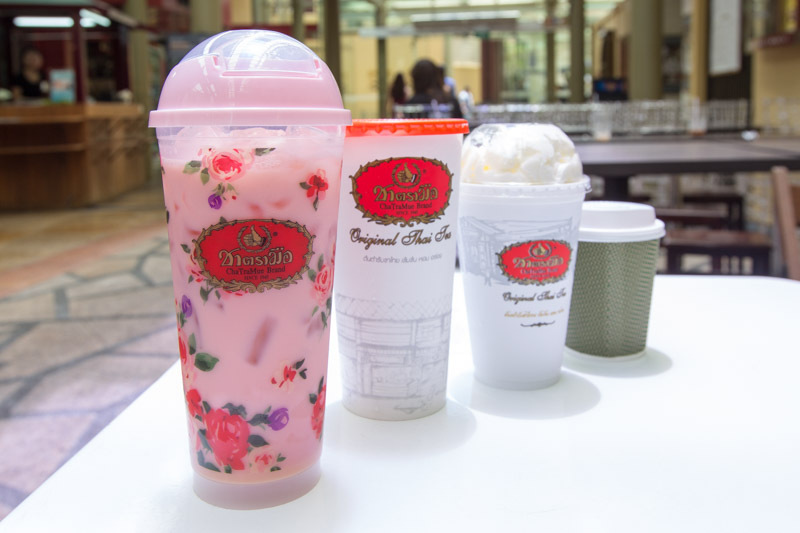 The most recent additions are the rose milk tea and the milk tea soft serve ice cream; unfortunately the ice cream machine broke down when I was there, but I got to try the rose milk tea, which comes in a super gorgeous plastic cup that can be reused, and some of the other popular drinks. 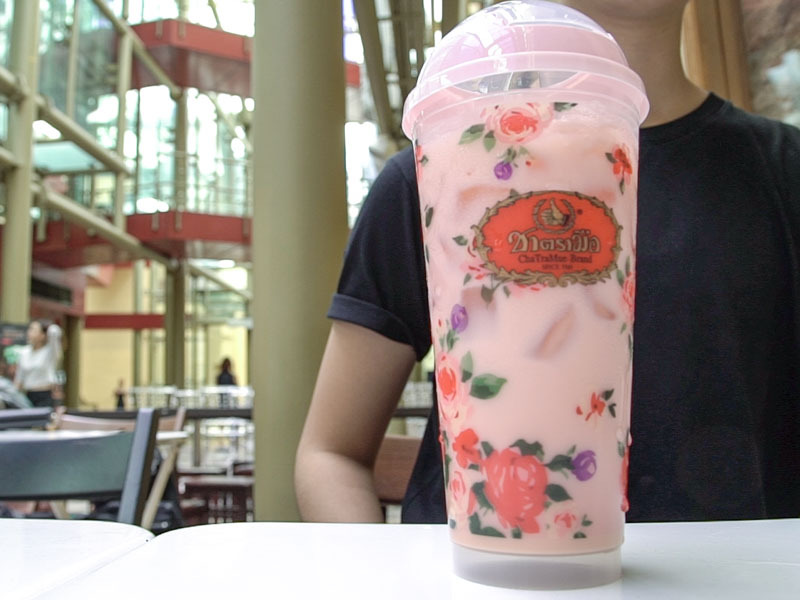 The Rose Milk Tea ($4.50) was similar to bandung, but with a strong tea taste. It wasn’t too thick, but the rose flavour still came through nicely. Cha Tra Mue warns that the rose drinks might cause a laxative effect; while I found myself perfectly fine after one cup, others with more sensitive stomachs might want to skip this drink if you have any long meetings scheduled after. I highly recommend the Original Milk Tea ($3) though; it was sweet while still retaining a strong tea flavour. The strength of the tea used in brewing prevents the sweetness of the milk tea from getting too jelak. 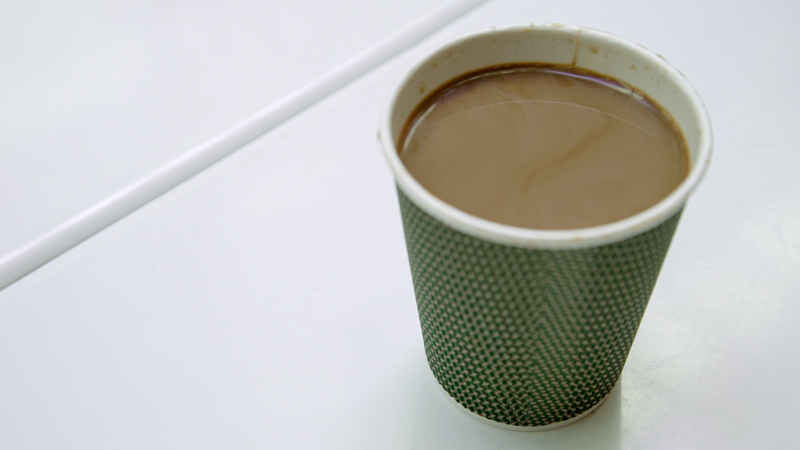 I was a little disappointed that there was a noticeable gap at the top of the cup however, and perhaps ice could have been added to fill the cup closer to the brim. 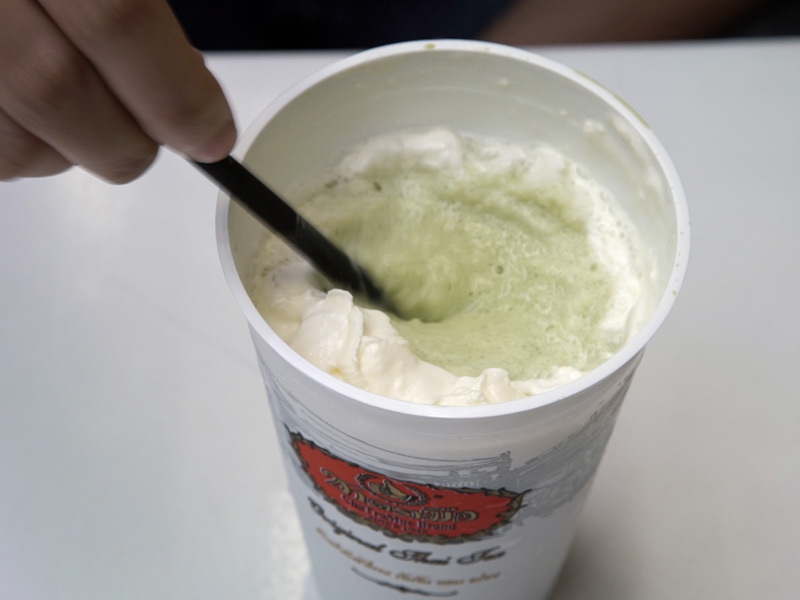 For something a little more refreshing, the Green Milk Tea Ice Blended ($4.20) is perfect. 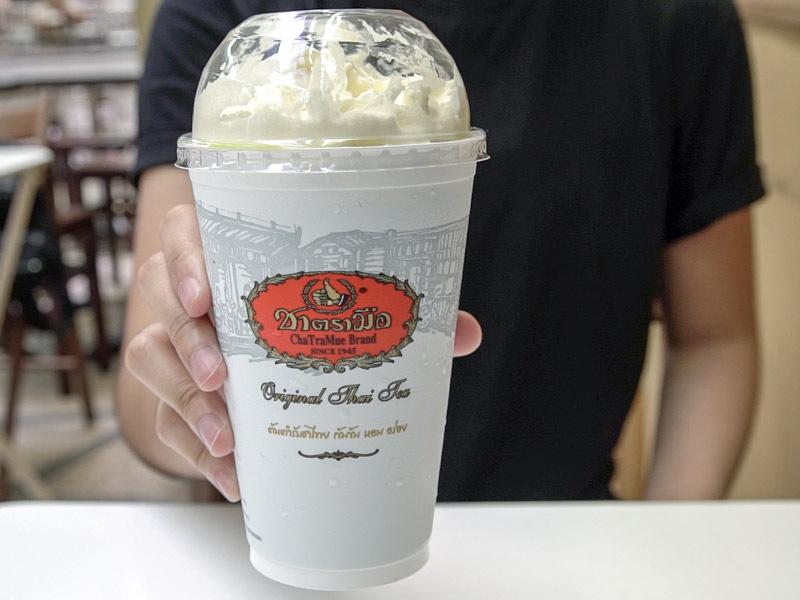 With a distinct floral taste, this is one refreshing drink, and the whipped cream added a nice smoothness. It doesn’t even get watery towards the end of the cup, so if you hate getting iced drinks because they start to dilute, this is what you should go for. 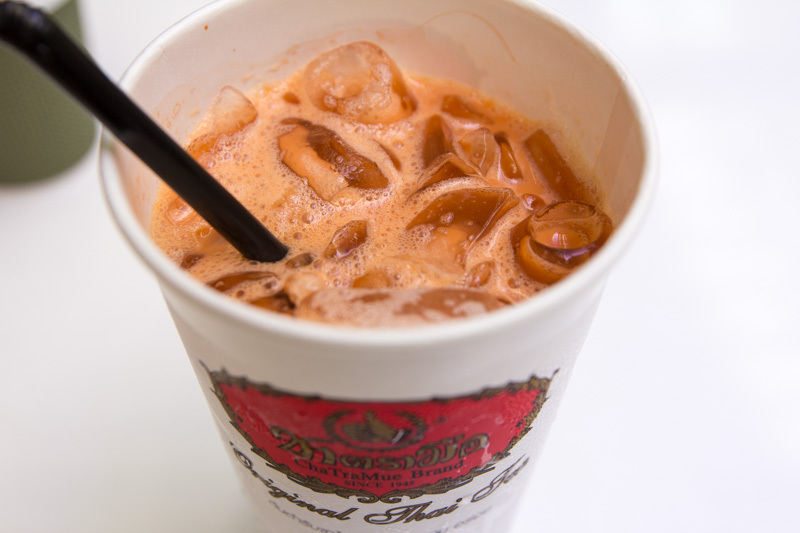 If you’re somehow not in the mood for milk tea, Cha Tra Mue’s Milk Coffee ($2.30) isn’t a bad choice either. The coffee was sweet and creamy, while the taste of the beans was still present albeit not too strong. Definitely something to help warm you up on cold, dreary days. I’m pretty disappointed that I didn’t get to try the soft serve ice cream, but I enjoyed the range of milk teas that were available and I’ll definitely be back again for the original milk tea that propelled this Thai milk tea shop to fame.